1 Miss Puerto Rico Stephanie Del Valle (C) reacts after winning in the Grand Final of the Miss World 2016 pageant at the MGM National Harbor, Dec. 18, 2016 in Oxon Hill, Maryland. 2 Members of the National Ballet of China perform The Peony Pavilion as part of the Out of Asia 2 season showcasing Asian art at Sadler's Wells theatre in London, Britain, Nov. 29, 2016. 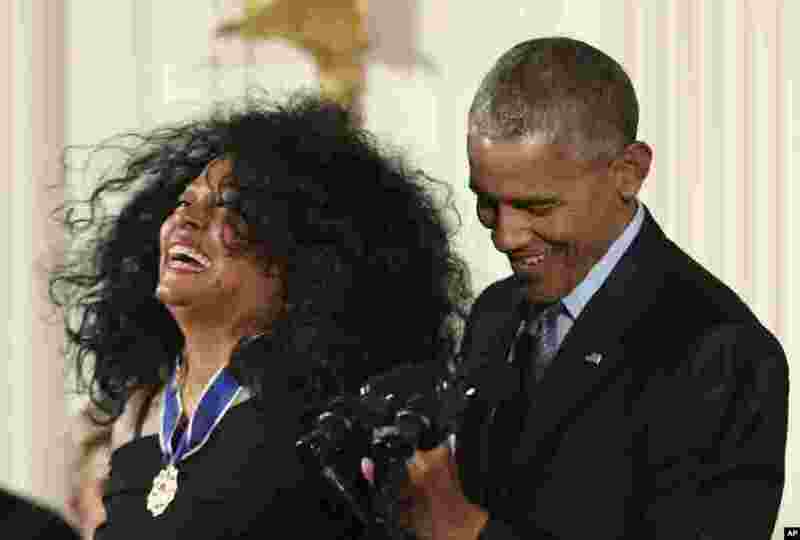 3 President Barack Obama presents the Presidential Medal of Freedom to Diana Ross during a ceremony in the East Room of the White House, Nov. 22, 2016, in Washington. 4 Host Gigi Hadid impersonates Melania Trump at the American Music Awards at the Microsoft Theater in Los Angeles, California, Nov. 20, 2016.